Moosh stands for MOOdle SHell. It is a commandline tool that will allow you to perform most common Moodle tasks. It's inspired by Drush - a similar tool for Drupal. moosh is licenced under GNU GPL v3 or any later. PHP 5.3+, Moodle 1.9, 2.2 or higher. Download moosh package from Moodle: https://moodle.org/plugins/view.php?id=522, unpack and cd into the directory. Follow "common steps" below. Install composer - see http://getcomposer.org/download . 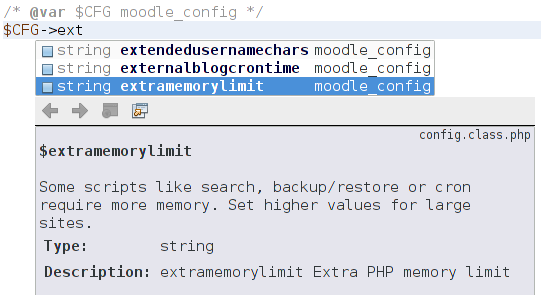 To get it to work with PHP Storm, simply drop that file somewhere into your Moodle project files. Fan-effing-tastic! Thank you. I've used Drush and it is so incredibly helpful. I just got this running on win 2k8 (not my choice) and it is useful as hell. Thanks! Soooo beautiful :-) Thank you! Using moosh, we have cut the number of hours required to prepare for each quarter from 120 to about 12. Thanks for the awesome tool!